Valid before last entry 1 A.M.
Carib Nation presents Bacchanal: The Easter Bank Holiday Carnival Party! 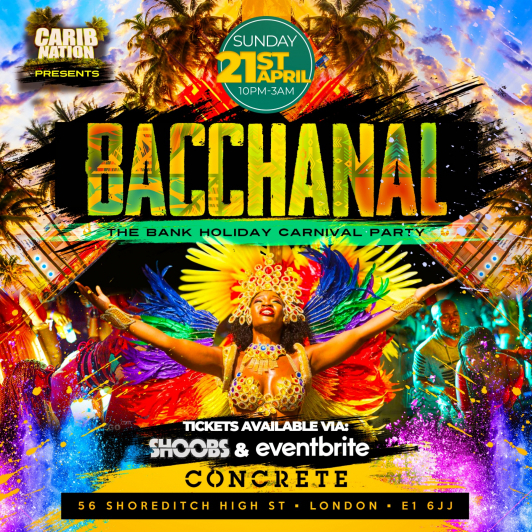 Sunday 21st April we are having one big Bacchanal in the party capital of London; Shoreditch. You can expect a real authentic Caribbean vibe coupled with the UK’s best entertainers on the night. We will have Carnival Dancers, Horns & Whistles as we make a memory! Casual: NO TRACKSUITS, HOODS OR SLIDERS! Get in the carnival mood and bring your own horns, whistles and flags! Doors open 10 P.M. Last entry 1 A.M.